The Auckland Muslim Association together with the University of Auckland, have brought to Auckland Sheikh Ebrahim Bham.The Sheikh appears to be planning to talk about two main topics. Supporting boycott (BDS) of Israel. Take note of the photos used. It is Pallywood in action. Who are committing all the knife attacks currently on Israeli citizens? Most of them are young teenage boys. When you see a photo of a teenage boy restrained ask yourself what he was doing a few seconds before that photo was taken, if it is, in fact, a genuine photo, not a Pallywood one. The fact that Pallywood exists tells us that there is a severe shortage of Israeli bad behaviour; so much so that Hamas has to fake it. Fancy that! Here is a video where he talks about Boycotting Israel and calls for increased support for BDS against Israel. Why is Auckland University promoting a speaker who is spreading lies about Israel and pushing the BDS movement? When the BDS were successful in their attacks against Soda Stream it cost hundreds of Palestinian employees their well-paid jobs. BDS are virtue signalling, Social justice bullies, ( useful idiots in other words) who are merely tools of Propaganda merchants like the Sheikh. They don’t help Palestinians they hurt them. They do it because it also hurts the Israelis. In other words, the ends justify the means. The Sheikh is also pushing the lie that Israel is an Apartheid state. Shaykh Ebrahim Bham will be coming to speak about the parallels between the South African apartheid (from an objective historical perspective as well as his own experiences) and the Israeli one. He’ll be looking at what apartheid meant for South Africa how it’s being applied in Israel before reviewing the international movement, and student movements which helped end South African apartheid and what we can do now in our activism and advocacy for Palestinians. The reality, of course, is not at all how it is painted by people like Sheikh Ebrahim Bham. Israel is a model of diversity and tolerance with gay beaches as well as public beaches shared by Jew and Muslim alike. Police reportedly had a woman remove her burkini on a Nice beach. Nice as in the French city (not pleasant or friendly). Once on a flight to Tel Aviv, I had a French airport security woman insist I remove my hat on the ramp on the way on to a plane; that was traumatic enough for me. Meanwhile, photographers have been heading to Israeli beaches for photos of local scenes. …No need for burkinis. 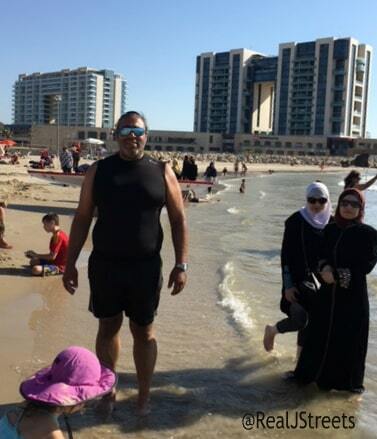 Arab women wear their street clothes into the water if they wish. But insisting a woman – anyone disrobe in public? Think what an international uproar that would cause! The Sheikh willfully misunderstands what Apartheid actually is. Protecting yourself from an enemy who has declared war on you is not Apartheid. It is self-defence.